Today is Araw ng Kagitingan, the Filipino for Day of Valor. We commemorate the Bataan Day or Bataan and Corregidor Day. Some find it puzzling that we celebrate the fall of Bataan which happened during World War II on April 9, 1942. But the reality is we celebrate not so much the fall but the heroism of our forefathers on that fateful day. Thousands of soldiers trooped to their death in that infamous Bataan Death March. Exactly one month from today we have both that privilege and obligation to troop to our respective precincts on May 9 to cast our votes in the coming elections. Expect it to be inconvenient with long lines and hot weather. Bring water, snacks, fan, reading materials, voting family members and friends. And most of all, bring a happy disposition with a dose of nationalism. Remember our countrymen who have been fighting for the love of country, for our freedom – from the Spanish era to the Japanese occupation to the American regime and even during Martial Law. Then hopefully, the discomfort won’t matter anymore. Whoever you’re voting for, go out and vote on May 9. 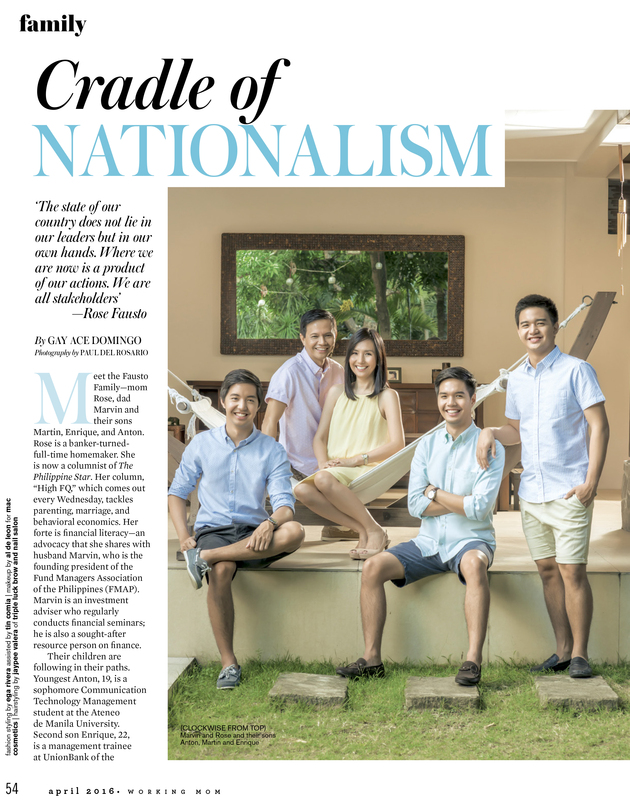 I wish to share this piece from Working Mom Magazine’s April 2016 issue where our family was featured in an article entitled Cradle of Nationalism.